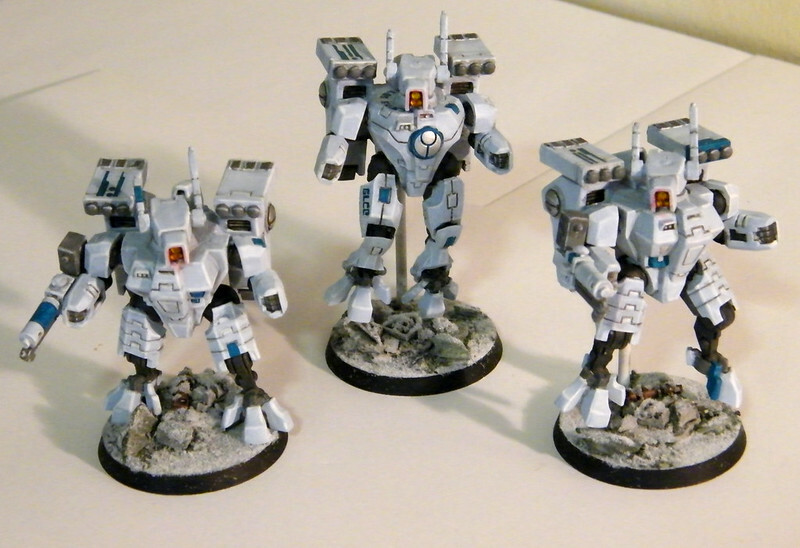 So guys, what's your favorite colour scheme for tau? It can't be the yellow/beige GW throw out way. I personally preffer a skull white main, shadow grey backing scheme. I do a light gray with dark gray tiger stripes for the larger sections and then black for the smaller parts. Add in some white and silver highlights and it looks pretty damned good. Okay. Both sound pretty interesting. I do like using tones when dry brushing gives the natural effect. Of course that comes down to if you can paint well. Skull white I'd recommend to any tau newbie. It just requires a few coats. As for defining units, or even unit markings I leave it all the same for the warriors. The only differentiation when I define units is by doing the helmet of the commanding unit a different colour. Usually something bright and bold. -Base coat of Fenrisian Grey, Dawnstone and Abaddon Black. I use markings in my Sept colour to mark out squad leaders etc. I started by using different markings on each squad of 12 Fire Warriors, but in practice I don't always field them in 12s, so it doesn't really matter on the table. If anyone is interested in seeing some more, they are in this set on Flickr. Personally, I don't find the drybrushing really works for many Tau models - too many flat or lightly curved armour panels. I use edge-highlighting for these with a detail brush. Thanks bud, I really do like your scheme. As I said I like a white main for ray. The highlights come out fantastically. Mixed with the dark used look I think you have a winner there. I may steal your no dry brushing tech. Thanks for the detailed reply , much appreciated. If anyone has a bright vibrant colored army, or even a select few models, get them up an posted. Here's a distance shot of one of my armies. Gives you an idea of the color scheme, anyway. I am nowhere near the painter Plastikente is, but they do look pretty good. I may steal your no dry brushing tech. It's not quite no-drybrushing, but I think I only do the cloth undersuits on Fire Warriors, because the creases and ridges lend themselves to it. @Wyddr: I like the tiger-stripes, and the colour scheme overall. I know it's not white, but it definitely puts me in mind of (Star Wars) Imperial Stormtroopers. I have a really hard time coming up with a color scheme for my Tau. I inherited tons of them all unpainted and need to come up with something. I love what other people have done just cant seem to find the "light bulb" I need to paint them. Thanks! I was going for something stormtrooper-y, but not obviously so. Also the dark gray-on-light gray is to some extend inspired by sharks/dolphins, which I thought fitting for the Tau given their aquatic themed vehicles. 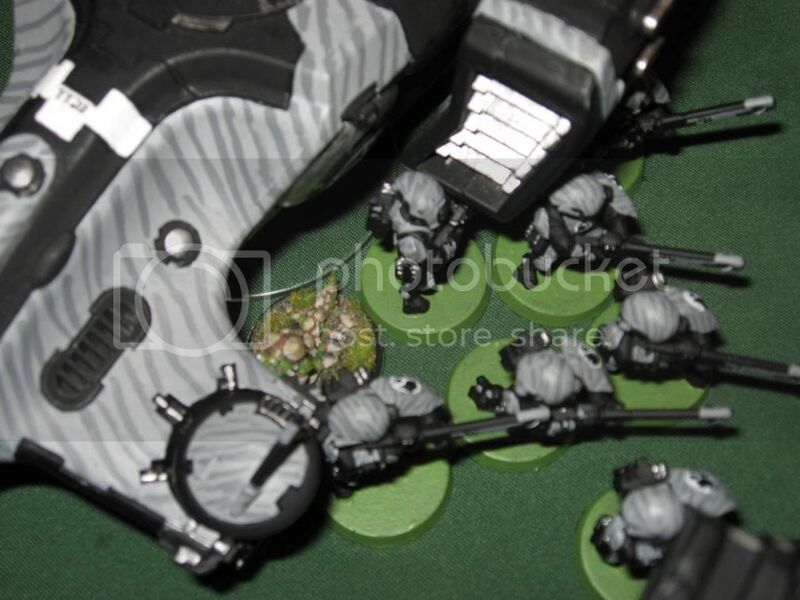 Yeah, Tau are great for camoflage/interesting patterns. All those wide spaces and smooth plates on their models really lend themselves to interesting paint schemes. Refuse Bot Malfunction! Quick cheese it! I like the default colours. However i think all the flat panels need to be shaded and not just edge highlighted as per GW style. Panels facing the sun/light source have to be ligher and panels underneath/ in shadow have to br sccordingly darker. This takes a lot of time and i guess they are just trying to keep everything a conistent theme with the older default colour scheme. Where to start. Where to start. Thanks for all replies its very interesting. 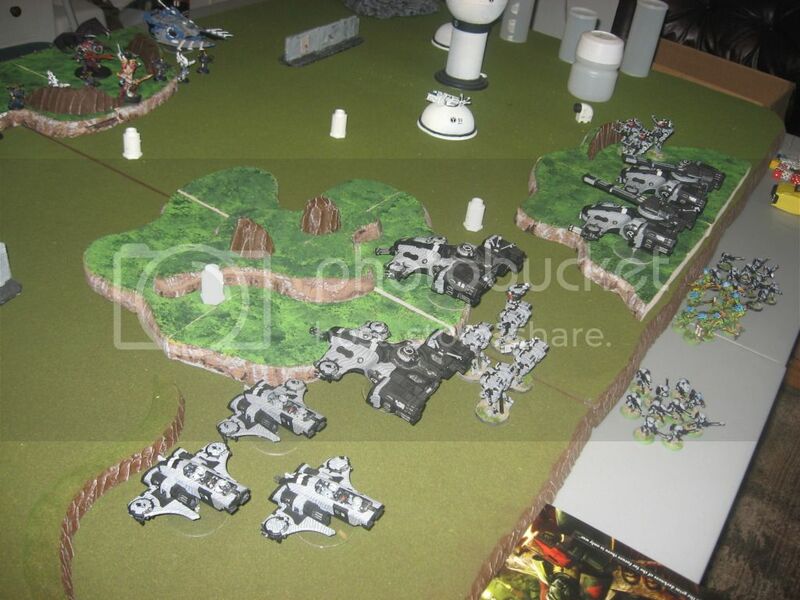 Honestly when I first painted a tau army I used a Shadow grey main cover coat. The bi found that using a chaos black backing in some of the armour came out awesome. I wish I had pictures. I fiud that the fire warriors looked much better than any vehicles I had done. The detail on the hammerheads etc. I find very lacking where's as all the intricacies with the troops really stand out. Even more so when you have a dark base colour. Sa'cea - grey with orange markings. This is pretty much the sole reason why I decided to start a Tau army. Mine are white, red, blue, yellow, and grey. Red are the helmet lens housing, flat portion of the shield, lower half of the breastplate, top half of the codpeice, and the hoof sections of the feet. Blue is the upper breastplate. Yellow is the helmet lens, Fire Caste insignia on the shield, and gyro on the pulse weapon. Grey is the backpack, majority of the rifle, and cloth. Also known as Gundam Prototype Colours, or Gundam Parade Colours. Combat colours are typically blue and white or bone, as per the Nu, Alex, GP, etc, etc... It's just that most series start with the protagonist hijacking a prototype.